Universal offers platforms that are suspended along the building façade with steel ropes. They move up and down according to work requirement and are powered by an electrical motor. They also come equipped with a number of safety features for safe working at desired height. Most common uses of these types of platforms are external plastering, glass cladding, cleaning etc. Specifications for Hanging / Suspended Platforms for 100 Mt. and 150 Mt. heights respectively are as mentioned below. Max. Height – 100 Mt. and 150 Mt. Rated Load Capacity – 200 Kgs. and 800 Kgs. and 1000 Kgs. Platform – (1.5 Mt.) and (2.5/5.7.5 Mt.) and (5 Mt.). Platform Size (W X H) – (0.68 X 1 Mt.). Weight – 800 Kgs. and 2000 Kgs. and 2300 Kgs. Counter Weight – (25 X 25 Kgs.) and (25 X 40 Kgs.) and (25 X 50 Kgs.). Steel Rope Diameter – 8.6 mm. 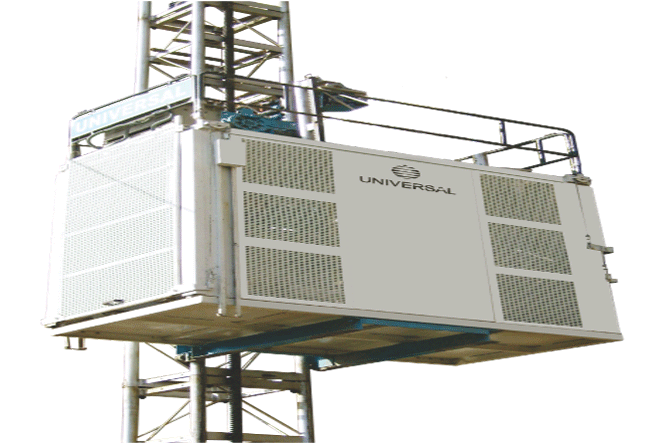 Universal offers the Hanging Platform also in the Galvanized metal construction instead of M.S. construction for specific requirements. 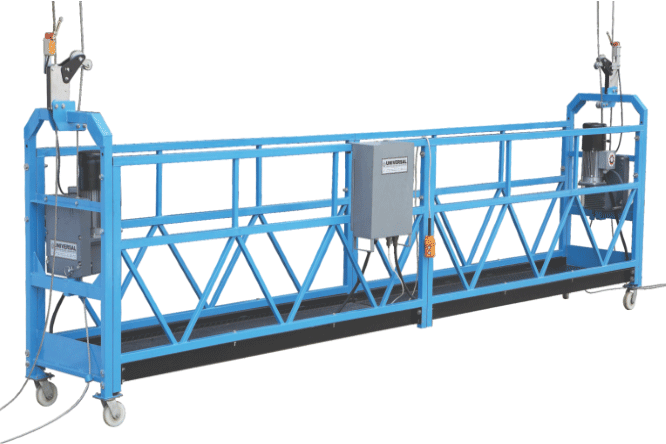 Specifications for the Galvanized Suspended Platform are mentioned below. Universal offers an extended / modified version of the Suspended Platform. This platform consists of two work decks and is powered by an electric motor for moving along the building façade. Easy and safe access to both decks is made available to the working personnel. 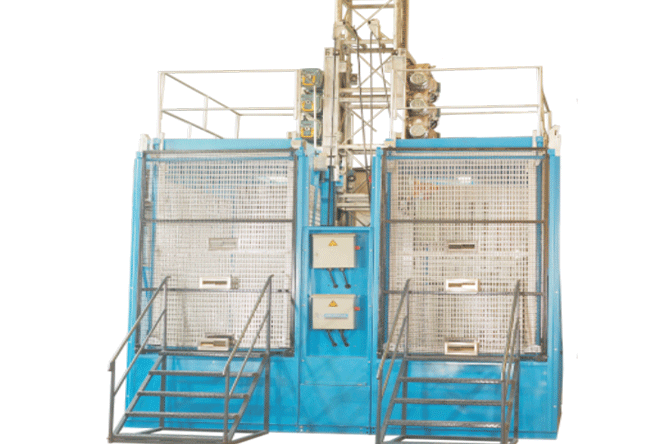 This platform comes equipped with all necessary safety features and provides a double working space. Specifications for Suspended Platform Double Deck are as mentioned below. Model – UHP 6 X 2. Rated Load – 800 Kgs. Length of Platform – 6 Mt. Safety Lock Type – LST 20. 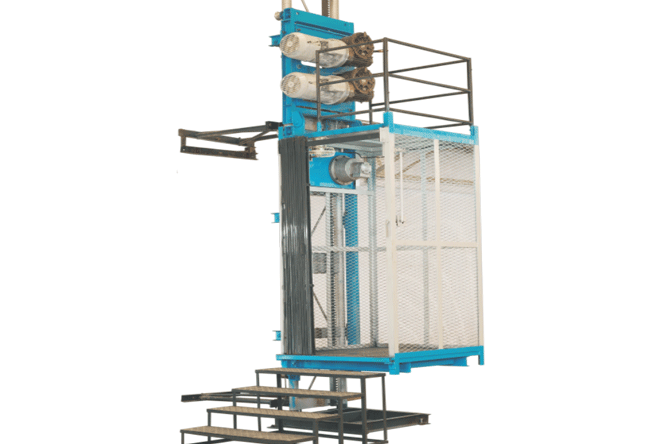 Hoist Model – LTD 8. Diameter of Steel Rope – 8.6 mm. Counter Weight – 25 Kgs. X 50 Pcs. Dimensions (L X W X H) – (6000 X 690 X 1180) mm. each Platform.